The president-elect of Ukraine talks about the future of his country and its recently-troubled relations with Russia. 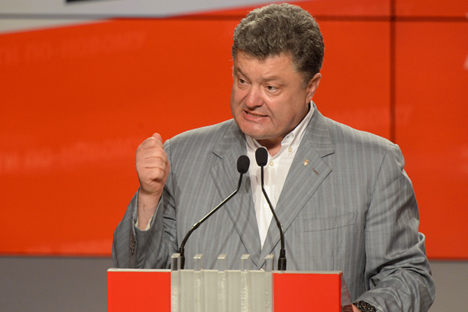 Billionaire businessman Petro Poroshenko was declared the winner of the May 25 presidential election held in Ukraine. In this frank interview with Kommersant, he discusses decentralisation of power in his country, gas payments to Russia and the status of the Crimean peninsula. How about Poland, Belarus…well? No. Not Poland, not Belarus, not Moldova… No, there are no federated states around us. There’s Germany and that’s it. Well, fine. Russia takes up half the world’s territory. But Russia is not really a federal state. A federal state has a weak central government. Would you say that the central government in Russia is weak? I just know that there is no power delegated. In Ukraine, the regions will have significantly greater power than the Russian federal subjects after I decentralize the country. But no, not federalization, but Ukrainian regions will have substantially greater powers than the Russian federal subjects. Is it possible to actually agree on what these terms mean? Is there really a difference between decentralization and federalization? Yes, there is a difference, because decentralization is when we, from one end, maintain the authority of a strong centre, and from the other end, give rights to the regions. We provide communities with the right to solve the majority of their own problems for their own people, without having to go to the centre to decide. In particular, problems that might worry or upset the Russian-speaking population. For example, what language they will speak. Why is anyone asking about a second government language? Why are we trying to force a citizen who lives in Ternopil, Lviv, Zhitomir, Vinnytsia, Poltva, Chernihiv, or Cherkassy to recognize Russian as a second language? There’s no need to do that. We have a particular status-quo, and any changes should be made for the purpose of solving problems. But, if the changes disrupt people’s lives? Sure, they shouldn’t be forced. But residents of the Donbas should also be allowed to speak Russian, and this right should be legally formalized so that they won’t be afraid someone will just take it away. A resident of the Donbas, for example, thinks that the problem is that he doesn’t have an official language that he can use in full measure for everything in his life. Not only in ordinary life—because today you can speak in any language at home or at work or wherever else and there is no problem, as you know as well as anyone. When you are speaking to a local government body, in court, or any other place in Russian, there is also no problem. But the right to defend this right… a person could possibly want to demand that. Okay, fine, I also demand that everyone around me in Donbas speak to me only in Russian if I want them to. You have the right. This is a community’s right. So, if a community decided they want to speak Russian, then let them speak in Russian. Maybe somewhere in Yenakiieve they want to speak English. It is your right. This right should be granted. No one can limit it. This is decentralization. Do you agree that there was a forceful seizure of power in Ukraine? We saw it ourselves live on TV. Where did you see that? What forceful seizure? Who seized what? Tell me. On December 1, as you surely know, since it was broadcast on every television network in the world, I stood up for the police and prevented any forceful seizure of any administrative building. My principal position that I’ve maintained throughout all the conflict is that I am fundamentally opposed to the seizure of any buildings. Today it is clear that the vast majority of Ukrainian citizens supported my position. So, excuse me, but the position that some people try to use to justify their actions, the position that there is no legitimate government in Ukraine, is cheating. When some people try to justify a foreign government’s military invasion onto the territory of another state—that’s called a violation of international law, it’s called an act of aggression. It is neither a good thing nor a bad thing. I am speaking objectively here. It is simply a position. If we think we can bring this to an international court—to the international court in the Hague, or at the UN—then let’s choose the court and let them decide. This is also one of the options that we have. But we can already imagine what they will say at The Hague. Then find another court. Find a court in Stockholm. Yes you do. There is the St. Petersburg International Arbitration Court for the resolution of commercial disputes in the CIS. I just participated in signing an agreement on free trade in the CIS that promises the court will work. Okay, but this isn’t constructive. So you’re saying that there are no courts in the world that would be able to decide on these kinds of inter-governmental problems? There are. The UN was founded for exactly this. So look: today, as a result of its actions, unfortunately, Russia is in international isolation. Well, Vladimir Putin’s visit to China doesn’t speak to the fact that Russia finds itself in international isolation. Well, fine. I’m not saying this malevolently. I am speaking about the high price that everyone pays today. You’re speaking with sympathy, then? Of course. This isn’t pleasant for me, the isolation, I mean. I am definitely not happy about it, absolutely not. I have sympathy. This high price that the whole world—and especially Russia and Ukraine—is paying just isn’t worth it. I wanted to ask: Did you want to become president? I bear it like a cross, if you understand the analogy. Will you pay for gas? For gas? Will we pay for gas? Of course we will, depending on the price. You insisted before on $268 per 1,000 cubic meters? I am not currently in the business. But you have a point of view. I think that the government of Ukraine isn’t obligated to do anything. We have business entities and we have agreements between business entities that are always changing; so whether $260, $460, or $550, it’s not a market price. I would like to pay the market price for gas. I don’t want to pay a political price. But right now the existing debt must at least be paid? Is there a debt for the seizure of our Chernomornaftogaz assets? Do you have to pay for those? You seized our Ukrainian wells, shouldn’t someone pay for that? The well yields gas. There are Ukrainian investments from the government budget in those wells. Who will pay? What do you think, shouldn’t someone pay? The wells are on the territory of the Kherson region. Paratroopers landed there. Look, how interesting. We must pay our debt, you say, but the seizure just needs to be discussed. We need to discuss everything. Look, you asked me whether we need to pay our debt? I am saying: We need to discuss all of these questions. This interview has been condensed and edited for clarity. First published in Russian by Kommersant.